Things have been crazy at the Red Dirt Rodz shop. Under the gun from print deadlines, I have been thrashing hard to get the Buick wagon to the paint booth. While I can’t go into all the details, lets just say that the ’63 Buick LeSabre wagon will be ready to hit the beach soon. Before the paint can go on, I had to get some body work finished. I thought I would give you all some teaser shots. Here you go! 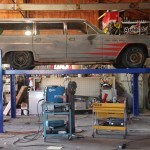 We had the wagon on the lift buttoning up the transmission install before heading out for the body shop. 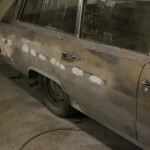 Before it got hauled off, we blasted the lower half of the car with crushed glass to rid it of paint and body filler. We would have blasted the entire car, but ran out of time. 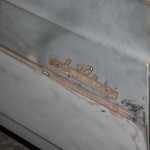 Using a trim tool, the chrome spears were removed. This will either break the clips, tweak the chrome, or warp the body. Sometimes all three. We also removed the LeSabre emblems. These will be airbrushed later. Using a large hi-speed sander, Scotty Mccubbin of Godspeed Customs removed the filler and paint from underneath the trim. 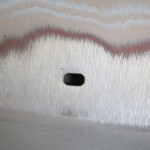 Most of the trim holes are shaped like this, though there were a few round holes. This is ready to be filled. 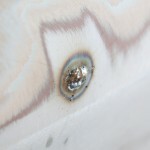 Using our Millermatic 211 MIG welder, I carefully welded up each hole. 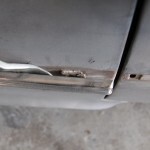 I didn’t use a filler piece, but I did use a copper spoon to suppor the back of the weld where possible. The weld won’t stick to the copper. Once the welds were finished, I ground each weld down and dressed them with filler. The body shop will take over from here.